Algerian Minister attributes Sarkozy's rise to power to the "Jewish lobby"
Le Figaro reported that, ahead of French President Nicolas Sarkozy’s visit to Algeria next week, Mohamed Cherif Abbès, War Veterans Minister, had attributed Mr. Sarkozy’s rise to power to the "Jewish lobby". As evidence of this, Mr Abbès referred to the appointment of Bernard Kouchner as Foreign Minister and underlined his Jewish "origins": "Why did Bernard Kouchner, a man of the Left, decide to change sides and join the government ? His move was not guided by personal convictions. 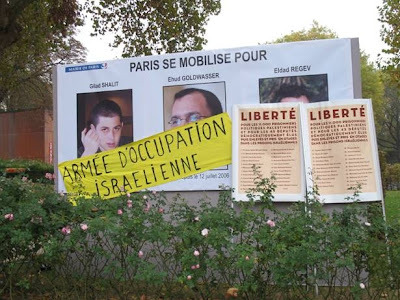 It was the result of a movement that reflects the aims of the real architects of Sarkozy’s rise to power, the Jewish lobby that has a monopoly on French industry." Mr. Abbas also hinted at President Sarkozy's "origins" - an explicit reference to his maternal grandfather who was Jewish: "You are aware of the roots of the French president and of those who brought him to power". He further added that, during the French electoral campaign, the Israeli authorities had issued a stamp bearing Sarkozy’s portrait. 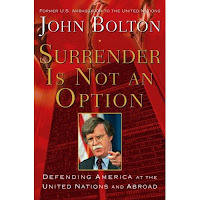 "Bolton includes a lengthy, hour-by-hour, description of the process at the State Department and the UN by which Resolution 1701 was adopted last summer, ending the Second Lebanon War. He makes it clear it was - to be diplomatic - not a stellar performance by the State Department. Ultimately, he writes, the resolution left a situation in which "it became increasingly clear that there was not going to be another resolution to disarm Hezbollah, that the arms embargo was not being enforced, that Hezbollah was rearming, and that "enhanced UNIFIL" looked and acted much like the existing, ineffective UNIFIL." "Because of its location, Israel experiences the terrorist threat almost daily, facing Hamas, Hezbollah, and other Islamic terrorist groups, not to mention being within range of Iranian missiles. Hamas has now seized control of the Gaza Strip, fracturing the Palestinian Authority, leaving the "former terrorists" of Fatah now in control of the West Bank; Hezbollah is close to overthrowing Lebanon’s democratic government; and Syria is increasingly under Iran’s control. Given this reality, there is no rationale for the United States to pressure Israel into "peace agreements" with its remaining Arab neighbors, or to believe that "dialogue" on such issues will have any material effect on the Middle East’s numerous other conflicts. . . . Of course, Israel’s own government for its own reasons may decide to make concessions in various negotiations, and bear the consequences, but the United States has no interest in precipitating such decisions." JCI: I’m speaking with Ambassador John Bolton; it’s October 30, 2007. Ambassador Bolton, I’d like to ask you if you think Condoleezza Rice will be successful in convening a peace conference in Annapolis, who might attend, what the outcome will be. AMBASSADOR BOLTON: I think the odds are that the conference will take place, but I am very skeptical that a positive outcome is possible. The circumstances in the region are just not conducive to progress, particularly on the Palestinian side, where there is no effective Palestinian Authority, no effective entity that can carry out commitments that might be made. And the risk is not simply that the conference will fail, but that a failed conference will leave us in a worse situation in the region. In a later conversation, Bolton indicated the two-state solution has run its course, and that any future solution will more likely be a three-state one involving the participation of Egypt and Jordan." "During the last few months, I've seen a number of editorials demanding that pundits be held accountable for their "complicity" in making the case for war in Iraq. Thanks to news cycles and short attention spans, pundits get away with murder. Columnists and talking heads can issue endless prognostications about what Iraq will look like in another six months, and because nobody’s going to remember to follow up six months on, it doesn’t matter whether they were right. The best way to correct the situation is by developing a predictions database, where experts can weigh-in on specific, falsifiable claims about the future, putting their reputations on the line. Something like this was envisioned in a DARPA program developed under Admiral John Poindexter in 2003. The so-called "policy analysis "market" was designed to allow analysts to buy futures contracts for various scenarios. As the value of these contracts went up or down, other analysts could observe and investigate why, determining how and why others were "putting their money where their mouths were", and whether they should do the same. Well now, that's interesting. What's also interesting is that Justin Logan is an analyst at the Cato Institute, which is affiliated with the Coalition for a Realistic Foreign Policy. John Mearsheimer and Stephen Walt are among the Coalition's founding members. Ted Galen Carpenter, Vice President for Defense and Foreign Policy Studies at the Cato Institute: A man who has predicted war so many times it's a wonder that we haven't been bombed back into the Bronze Age. In the last eight years he's warned of a forthcoming war with China; a forthcoming Turkish war against Greece; a Marxist/narcotrafficking takeover of Colombia; and war with North Korea. And there, my friends, are the "realist" pundits. By all means, let's add them to the "predictions database," so everyone can see firsthand their true market value." Simon Deng, a native of the Shiluk Kingdom in southern Sudan, is an escaped jihad slave and a leading human rights activist. Simon Deng has this piece in the Jewish Advocate. Late last month, I went to hear Bishop Desmond Tutu speak at Boston’s Old South Church at a conference on "Israel Apartheid." Tutu is a well respected man of God. He brought reconciliation between blacks and whites in South Africa. That he would lead a conference that damns the Jewish state is very disturbing to me. Bishop, when you used to dance for Mandela’s freedom, we Africans – all over Africa – joined in. Our support was key in your freedom. But when children in Burundi and Kinshasa, all the way to Liberia and Sierra Leone, and in particular in Sudan, cried and called for rescue, you heard but chose to be silent. Today, black children are enslaved in Sudan, the last place in the continent of Africa where humans are owned by other humans – I was part of the movement to stop slavery in Mauritania, which just now abolished the practice. But you were not with us, Bishop Tutu. So where is Desmond Tutu when my people call out for freedom? Slaughter and genocide and slavery are lashing Africans right now. Where are you for Sudan, Bishop Tutu? You are busy attacking the Jewish state. Why?" The sand and the land I was promised. The cities of Israel, the land of Israel. Will retreat before the star of David. The land of Israel, the children of Israel. 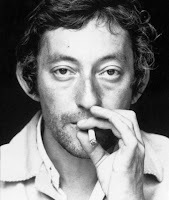 This song was presented by Serge Gainsbourg to the State of Israel. It was composed in June 1967 during the Six-Day war. Stephen Walt and John Mearsheimer’s extensive use of footnotes in The Israel Lobby and U.S. Foreign Policy has been the subject of as much comment as has the carelessness of their research. I had a look at the footnote section of the book and was intrigued by the last one, to be precise the 1,399th according to Leonard Fein who took the trouble of counting them. Indeed, footnote No. 1,399 refers to a manifesto concocted by 25 German peace activists (in fact 17, the other 8 only expressed support, but did not sign) and was sent for publication by the authors themselves to the Spanish website Tlaxcala. The manifesto Why the "special relationship" between Germany and Israel has to be reconsidered recycles the usual anti-Jewish tropes and is illustrated by an Iranian cartoonist Jaber Asadi. The cartoon depicts a brutish and heavily armed Israeli soldier who does not look at his victims (not enemies of course) and who cowardly hides behind a tombstone marked "Holocaust". Got it? To be associated with such a blatantly anti-Semitic cartoon did not seem to trouble in the least either the "peace activists" or Walt and Mearsheimer. A proper look at the other 1,389 footnotes might reveal a few more surprises of the kind. By Khalid Amayreh: Israel: perpetual criminal, perpetual liar; Israel’s silent holocaust against the Palestinians; Grand-Children of the Holocaust turning Gaza into another Ghetto Warsaw. By Fausto Giudice and Ben Heine An oblivion repaired, A motto for Israel, discussed here and here. "French President Nicolas Sarkozy was honored today [7 Nov.] by the American Jewish Committee with the global advocacy organization’s prestigious Light Unto the Nations Award. 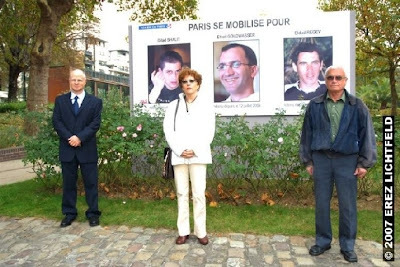 "Above all, we honor President Sarkozy’s conviction, conscience, and courage - qualities that are in short supply in a world desperately in need of all three," said AJC Executive Director David A. Harris. The AJC award pays tribute to outstanding statesmanship. "President Nicolas Sarkozy is a man of passion," said Harris. "It is his passion, combined with his conviction, conscience, and courage, that has quickly elevated him to a place of exceptional prominence and respect on the global stage." 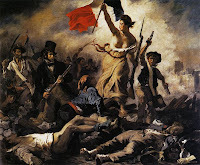 "Anti-Semitism must be attacked head on," declared President Sarkozy. "Once you try to explain anti-Semitism, you are rationalizing anti-Semitism." He said anti-Semitism is a reality that must be acknowledged, not denied. "We cannot fight against what is denied," he said. "Unless you agree on a diagnosis, you cannot find the remedy." "He is steadfast in his opposition to anti-Semitism," said Harris, recalling President Sarkozy’s words at a 2004 AJC luncheon in Washington, when he declared: "I consider any insult against Jews an insult against France."" 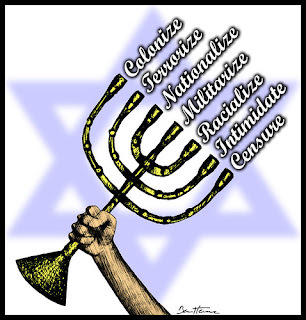 "The present anti-Semitic edifice is built on two equally powerful pillars. One has to do with the culture of the hatred and prejudice that marks us as a people. However, the other pillar is absolutely necessary for those prejudices to take wing and fly: the informative lie. And "lie", nowadays, is a verb conjugated with equal enthusiasm by journalists and intellectuals, to such a degree that the truth about Israel and the Arab-Israeli conflict is being superseded by a parallel truth, based on the distortion and falsification of history. Here, too, there is nothing new, inasmuch as historical and contemporary anti-Semitism have to do with lying. I will put in the harsh terms merited by the accusation: Europe - erudite, intellectual, media-minded; the Europe that reports daily on the Middle East and which is responsible for the voraciously anti-Israel cast of opinion, is rewriting a new version of the Protocols of the Elders of Zion. 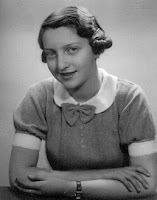 The secret agents of czarism have replaced by modern-day journalists; the ancient peril of a Jewish plot is now being couched as a Yankee-Israeli plot; the evil Jew of yesteryear is the same evil Jew he always was, except that now his plot is situated on Wall Street and he has an army. I shall never cease to be amazed and horrified by the force of old iniquities. The Anti-Defamation League (ADL) put it this way in a study it conducted among adults in five European countries: it is alarming to find in this post-Holocaust and post-September-11th world that one out of five persons believes in the old slanders. In Spain, for instance, some 70% believe in the concept of a Jewish financial lobby, as lobby that, naturally, pulls the world’s strings. Thus, in the beginning of time, we had Christian texts converting the Jewish people into God killers. I believe that somewhere there is a wretch who wants to make a movie out of it… In 1903, we had the Protocols garbed by the Russian extreme right, who contributed to instigating the pogroms that devastated that country until 1914, with the slaughter of 60,000 Jews in the civil war between the whites and the reds. In 1920, we had Henry Ford and frenzied international Jew. And in vanquished and convulsed Germany, well nourished on the Protocols, Hitler wrote his Mein Kampf and Rosenberg and Goebbels saw to the propagation of hatred and, therefore, the legitimization of persecution. The outcome is well known. Today, the same Europe which gave rise to everything - hatred, persecution and extermination, is now giving birth to a new narrative whose stigmas are distant and the distortion of which is equally inconsiderate and whose consequences, in any event, will never be good. This is my explicit accusation: the journalistic and intellectual world, fundamentally composed of leftists, has written new highly influential Protocols, with devastating consequences. Day by day, with every news item, with every declaration, we don’t have the odd ferocious book; today, we have a library full of them. Like their forebears, the Protocols of the Sages of Information are fake, criminal and false. Israel is the target. 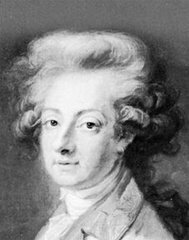 The reason - there are many, most of which are ignoble. The justification is Sharon. The excuse - anti-Zionism. The weapon - prestige. The propagator - thousands of media. The ally - Arafat. The result - anti-Semitism." From a speech delivered at the International Keren Hayesod Conference, 25.11.2003. A record number of local churches in Europe are expected to commemorate the International Holocaust Remembrance Day on Sunday 27 January 2008. 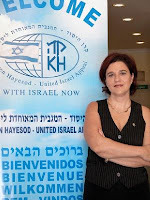 The Remembrance Day, which was initiated by the European Parliament already in 2000 and supported by a declaration of the United Nations in 2005, was first introduced to church communities in Europe a year ago by the European Coalition for Israel. The Coalition brings together organizations and churches which seek to foster better relations between Europe and Israel, commemorate the Holocaust and inform about new forms of anti-Semitism. "The Holocaust was a defining phase in Europe's modern history, and its commemoration remains a crucial reminder of what can happen in Europe when we stray from our Judeo-Christian foundations." Already last year a few hundred churches participated in the campaign despite short notice. This year the organizers will ask each church to also register....“Many churches have asked for a concrete program for the Holocaust event and we will provide them with one”, says Tomas Sandell who is the main coordinator of the campaign and the founding director of European Coalition for Israel. One of the main objectives of the campaign is to learn what the consequences are when Christians fail to speak up against the evil of our time. One particular issue which is raised in the campaign material is the need for Christians to react differently today when the Jewish nation is threatened with annihilation. The organizers hope that the campaign will teach and inspire Christians in Europe to speak up against any form of evil or genocide. 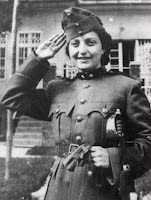 "The atrocities of the Nazis started with the Jews but it did not stop there. 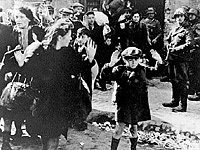 The same pattern can be seen today with those forces who once again wish to eliminate the Jewish people", says Sandell. 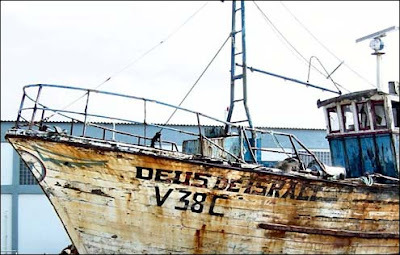 Nuno Guerreiro has just celebrated the 4th anniversary of Rua da Judiaria with the publication of the photograph of an old fishing boat named "Deus de Israel" taken by Luis Novaes Tito in Viana do Castelo (Portugal). Many congratulations to Nuno. "Comparing the Israeli-Palestinian conflict to Northern Ireland is "misleading and demonstrably false," Lord David Trimble, a 1998 Nobel Peace Laureate for his efforts to find a peaceful solution to the conflict in Northern Ireland, said last week. The former leader of the Ulster Unionist Party and ex-first minister of Northern Ireland said there had been a "selective reading" of the Northern Ireland conflict that was "misleading and demonstrably false." In many cases, he said, it was more about contemporary agendas in the Middle East than serious analysis of the recent history of Northern Ireland. "Nowhere is the analogy applied more vigorously than in the case of the Israel-Palestinian conflict," Trimble said. "For those eager to inject a creative breakthrough there, the lessons from Northern Ireland are often cited as an inspiration. The foremost expression of this can be seen in the response of many to the growing status and influence of Hamas in recent years. He called on the Middle East Quartet and international community to "stand firm" regarding Hamas ahead of the Annapolis conference next month. "It is essential to recognize that Northern Ireland's peace process operated within a distinct context - and one scarcely repeated elsewhere... this narrative which has been transported - often uncritically - to the Middle East, is fundamentally misleading about the true achievements of the Northern Ireland peace process," Trimble said. He questioned whether players in the Israeli-Palestinian conflict were seeking victory or accommodation. Whereas the majority in Israel wanted "accommodation," Hamas might still be on the lookout for "victories," he said. Hamas doesn't want accommodation; rather, they have played into the hands of the most intransigent elements in the Middle East, Trimble said." 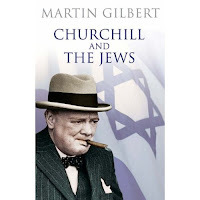 Churchill: "It is a question of which civilisation you prefer"
"Coupland* then complained that the Jewish Agency – set up in 1930 a liaison between the Jews of Palestine and the British Mandate, and headed by David Ben-Gurion – had its representatives in London "and they can speak to the Colonial Office and the Arabs feel on their side they are rather left in the cold. They have not the great engine the Jews have." Churchill replied brusquely, not hiding his preference: "It is a question of which civilisation you prefer"."